This was the question designers answered at “Speak Up, Scale Down,” a juried design show held at the Pet Shop Gallery in Omaha in December 2018. Student graphic designers from the University of Nebraska at Omaha and professional designers from the local area were challenged to create small-scale 4”x6” risograph prints with a large impact. Designers were forced to creatively overcome the scale limitation through dynamic layouts, colors, and images. The goal of the show was to present local design talent as well as raise money for Benson First Friday, an Omaha based nonprofit dedicated to supporting the region’s emerging and established artists. Exhibition poster hanging in Omaha’s Benson neighborhood. A sampling of professional micro-poster submissions. Top left: Joe Cutler & Paul Meyer. Bottom left: Michael Stevens. Right: Cody Fenske. 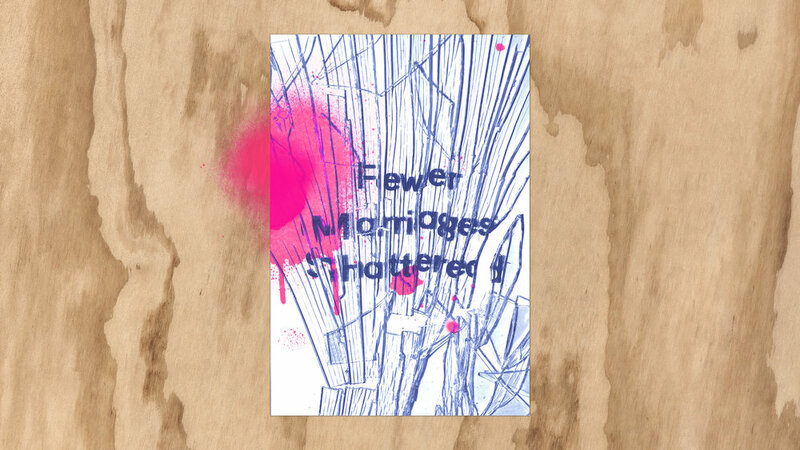 Fewer Marriages Shattered, Filament’s submission to the show answering the prompt “If you could change one thing about the world, what would it be?” | 4“x6” risograph print.